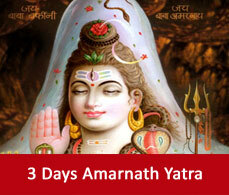 This sacred yatra is organised by the government of Delhi every year in the month of Shravan. It generally starts from Pahalgam but now the route from Baltal has also been open for the tourists. Pilgrims are advised to carry enough woollen garments like sweaters, heavy jackets, monkey caps, drawers etc. You should also carry a stick, torch, sleeping bag, blankets, umbrella, waterproof shoes or boots etc. Ladies are advised not to wear saris while trekking. Instead pants or salwar suits with drawer will help to do the needful. Required rations can be obtained at fair price rates from the Government depots in Chandanwari, Sheshnag and Panchtami. Small tea shops and restaurants are also available at the side of the roads. But it is better to carry toffees, tinned food, biscuits etc to fulfill your appetite in case of emergencies.Gas or firewood services are also available in Chandanwari, Sheshnag, Panchtarni and near the cave as well. Medical check-up are conducted on the pilgrims free of cost in the medical posts assisted by the famous medical doctors and staff to go for the yatra. But the pilgrims are required to carry their prescribed medicines. All pilgrims are advised to insure themselves before starting for the yatra due to the hazardous route of the yatra. Insurance facility is also available at the base camps during the yatra. Rented accommodation facilities are available for tourists during their yatra where they will get the bedding arrangements to relax their body. It is available for use on payment basis. Pilgrims can book the accommodations at the base camps only. Registration of the yatris are done before the dates are announced for the starting of the yatra. The dates are generally announced through press advertisements. 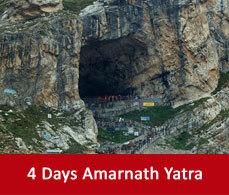 No yatris will be allowed to go for the yatra without any registration card from the government. All application for langar permission from NGOs should reach the Director of Tourism office in Srinagar before the cut-off dates. 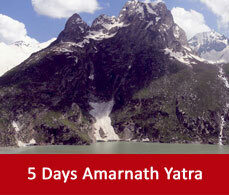 Before starting for the yatra do ensure that you are physically and mentally fit for this trekking journey. Get yourself medically certified and submit that certificate to the specified registering officer of your residence. Carry sufficient heavy woollen garments. Do carry some light food items and also carry some accessories like spoons, tumbler, plastic plates, water bottles etc. Ration and firewood are available for the yatris at all stations during the yatra against payment. Make sure that the ponnywalla and the labourers who are at your service is properly registered and carries a token with them. Do not pay them with high price and fix them from the right authority at the base camps of Pahalgam. The ponnies which will carry your belongings and eatables should always stay with you all time. If they remain behind you then it will cause inconvenience while your trekking. Always abide by the rules and guidelines given by the Yatra officers. The police and the officials from other departments will always be there while your yatra to help you. Carry sufficient money during your yatra to avoid any hazards. Though medical check up is free but do carry your own medical kit as well for emergencies. Carrying or intake of alcohol is strictly prohibited. Do not put extra effort on steep gradients, try to avoid those. Do not take rest on those places where warning notices are given. Do not break traffic guidelines or try to overtake other pilgrims while trekking. Do not overpay for the ponnies, accommodations, dandies etc. Do not use plastic tents during the yatra.